In March 2011, Geoscience Australia released AUSGeoid09, replacing its decade-old ancestor AUSGeoid98. AUSGeoid09 provides an improved geoid model for Australia to relate GNSS-derived ellipsoidal heights to the Australian Height Datum (AHD71, or AHD83 in Tasmania) and vice versa. According to Geoscience Australia, it is expected to convert GNSS heights to AHD71 heights to better than 50 millimetres across most of Australia. In some areas the accuracy may exceed a decimetre due to localised errors in the ageing levelling network, GNSS observational errors, land subsidence, geoid anomalies, or simply a lack of data in some remote locations. In comparison, its predecessor AUSGeoid98 only provided an estimated accuracy of better than 0.4 metres in absolute terms. 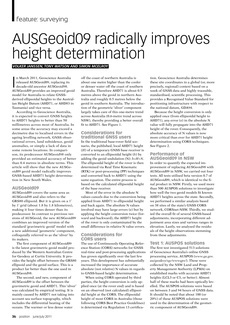 This article shows that the new AUSGeoid09 geoid model radically improves GNSS-based AHD71 height determination in New South Wales.